Robertson was placed on the 10-day injured list Monday with right elbow soreness, Matt Breen of The Philadelphia Inquirer reports. This comes as a bit of a surprise, as Robertson fired a pair of scoreless innings in Sunday's win over the Marlins. 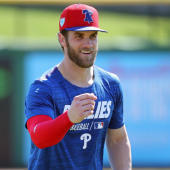 The severity of the issue remains unclear; the 34-year-old doesn't seem overly worried at the moment but is scheduled to undergo an MRI on Tuesday, according to Scott Lauber of The Philadelphia Inquirer. Drew Anderson was recalled from Triple-A Lehigh Valley to take Robertson's place in the bullpen, while Seranthony Dominguez and Hector Neris are candidates to get save opportunities while the veteran right-hander is on the shelf.